The former national champion’s shoe that was sliced open today in a crash in the Irish cycling National Road Race Championships. Earlier in the year when a Team Sky rider had his shoe sliced open in a crash, disc brakes got the blame. Marcel Kittel (QuickStep Flooring) came down with Owain Doull in a crash at the Abu Dhabi Tour. Doull’s shoe was sliced open, drawing blood from the top of his foot. And because Kittel was the only rider in the field using discs, the finger of blame was pointed at the German and his brakes. Kittel insisted his brakes weren’t to blame. But such was the pressure from inside and outside the peloton that he stopped using them in the race. 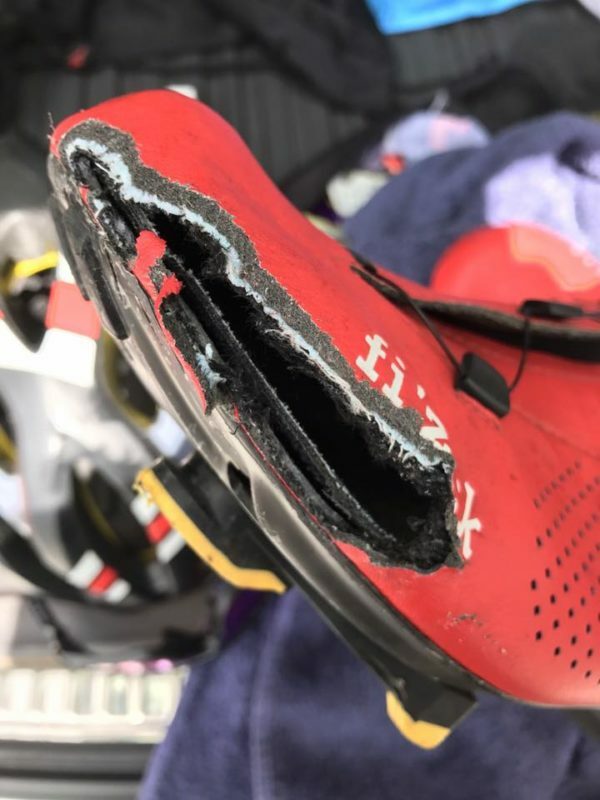 While some pro teams are still using the brakes, as part of a UCI trial in pro racing, photos of Doull’s shoe went viral. And the reputation of disc brakes was damaged further after other high profile incidents last year. A similar sliced shoe incident occurred at Irish cycling’s National Road Race Championships today. And those who blamed discs for the incident involving Doull may want to think again considering the Irish case. With disc brakes not allowed at the Irish Road Race Championships this weekend, they simply could not have caused the damage to top Masters 40 rider Aidan Crowley’s shoe. A winner of the road title two years ago in Omagh, Crowley came down in a crash with a large number of other riders today after about 55km. The large spill in the Masters 40 race occurred on the approach to one of the bridges on the course, near the end of the third lap. And when Crowley got up off the tarmac and back on his bike, he noticed one of his shoes was “like a flip flop”. “The crash took about 40 riders out, a couple of ambulances were involved,” he said. Crowley added while crashes were always a feature of road racing, a swell of riders going into the tight bend to cross the bridge meant large numbers came down. 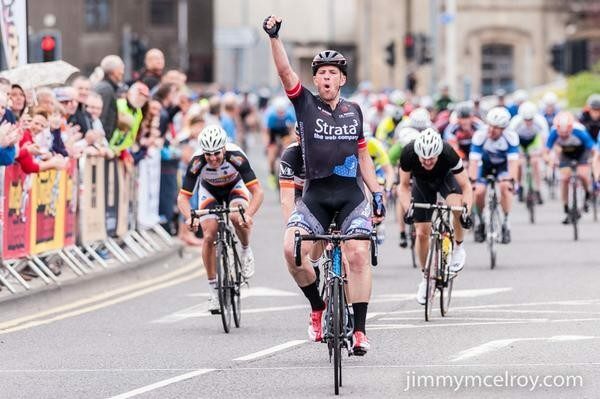 His crashing out of the peloton didn’t stop his team Strata 3-VeloRevolution squad winning the team prize. Anthony Doyle took the bronze medal and with Barry Sutton and Frank Dunne took team gold. “To be honest I haven’t a cut on me but only because I feel on other lads. I fell on my right side and it was my left shoe got sliced. “My leg was up in the air at one point and another rider’s bike fell on me. I got back up and had to let my brake out because the wheel was buckled.